America, the land of the free, the home of the brave, and now a country where you can go to jail for choosing not to smoke. As much as I wish that this was the perfect beginning to a satirical post, the State of Pennsylvania has deemed it fit to treat harm reduction products used for vaping as the two-headed demon monkeys from your worst nightmare. 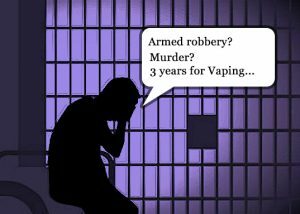 In 1931 Al Capone was jailed for tax evasion, and as of October 1st, if you live in the Keystone State you can face hefty fines and up to 5 years in prison if you don’t pay a 40% tax to the state for any vapor product you buy. In 1776, people went to war over a 2 penny tax on Tea, but vapers are expected to bend over and take it in 2016. This law, and many like it sprouting up across the United States, is farcical to say the least. Unless you can prove that your device was obtained at a state sanctioned retailer, you can kiss it goodbye and probably some hard-earned cash as well. Has the nanny state lost its mind as it decriminalize’s pot and leaves cigarettes in every corner store, but decides that the best way to cram the coffers full of cash is lean heavy on people trying their damnedest to break free of the chains of tobacco addiction? Businesses are about to fold under the weight of this inane legislation, 40% wholesale tax on products put on the shelves after October 1st, and a floor tax that says back taxes are applicable. If a business has $100,000 worth of stock, it better have $40,000 90 days after the law goes into effect… or have its doors closed for good. If you’re one of the many hundreds of thousands of vapers who think they can get around the law by buying online, have no fear. However, if you get caught, you will be treated as an import business and get hit with the same deal. In all honesty though, the majority of sellers outside the State will probably choose to stay away just as they have in other places across the country, because who wants to get dragged into someone else’s mess? I’m not sure if you’ve noticed, but this idiocy is spreading like the Chicken Pox. If this doesn’t make you angry, there’s something dislodged in your cranium. Plain and simple, if this can happen in California, New York, West Virginia, Illinois, Pennsylvania, and the other states that have already been hit, it’s only a matter of time before your rights get smashed as well. 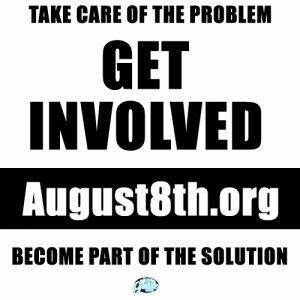 Get angry, get involved, and make sure everyone understands that this isn’t about keeping costs down for people who are vaping right now, and it isn’t about making sure we have access to devices and e-liquid. It’s about making sure that millions of people who need this technology to help them get away from cigarettes have access. If you aren’t already a member of CASAA, join now, make sure your family and friends are involved with our fight. It doesn’t matter that they don’t use these products, but it’s time that they understand why we all do. Whats that old saying. Its on the tip of my tongue… Oh ya!!! My cold dead hands before i give up my vaping and start smoking again!! So if I buy a mod for my own personal use they can put me in jail for not paying tax?